Home > Forums > Journal Clubs > Paper: What Is Spontaneous Pain and Who Has It? Editors' Note: Thanks to Steve Davidson and Daniel Brenner of Washington University Medical School, St. Louis, US, for submitting this Journal Club. The Wash U Pain & Itch Journal Club discussed Gary Bennett’s recent commentary on spontaneous pain, an issue relevant to the translation of animal studies in pain to clinical problems. The group raised some interesting questions—if you have insights to add, please continue the discussion by leaving a comment below. J Pain. 2012 Oct; 13(10):921-9. Basic pain scientists are being pressed for the lack of translational benefits realized from the many potential analgesic targets they have identified. One reason offered by Vierck et al. (Vierck et al., 2008) and Mogil (Pain Research Forum, "What is the reason for lack of translation in the pain field?") is that basic scientists may be taking the wrong approach to studying pain in animals. While many patients suffer from ongoing or “spontaneous” pain, most animal studies measure stimulus-evoked withdrawal responses to assess hypersensitivity. The presumption is that the biology of hypersensitivity in animals is reflective of the processes at work in a patient with ongoing pain. Is it so? Dr. Bennett’s thoughtful Focus Article in the October issue of The Journal of Pain considers the nature of spontaneous pain and offers new insight to address the translation problem. To begin, Dr. Bennett clarifies misconceptions about the definition of spontaneous pain and rightfully asserts its incompatibility with ongoing inflammatory pain. Our group was convinced by Bennett’s argument that pain must not be considered spontaneous, i.e., arising from intrinsic activity of the neurons involved in signaling pain, if the neural activity is elicited by an external (extracellular) source, such as an inflammatory agent. We discussed the idea that sensitization could outlast inflammation and still generate neural activity. For example, if lasting sensitization of the heat-activated channel TRPV1 caused the channel to open at normal body temperature and such a mechanism produced ongoing pain, would it be spontaneous? Without the continuous presence of a “sensitizing” (inflammatory?) agent, this pain would likely be short lived, anyway, lasting only as long as the sensitized protein remained positioned to function. In the case of neuropathy, Dr. Bennett describes several possible scenarios in which pain might be considered spontaneous, including deafferentation-induced spontaneous discharge in CNS neurons and discharge in otherwise quiescent nociceptors occurring after injury. We discussed the possibility that deafferentation could lead to spinal disinhibition as well as spontaneous discharge in excitatory neurons. Regarding silent nociceptors, Kleggetveit et al. (Kleggetveit et al., 2012) recently described a much greater number of both spontaneously active and mechanically sensitized C-fibers in patients with painful rather than non-painful neuropathy. Interestingly, the C-fibers with spontaneous activity were largely distinct from those with mechanical sensitization, suggesting a possible anatomical distinction between spontaneous pain and stimulus-evoked hypersensitivity in painful neuropathy. However, as Dr. Bennett would likely point out: Both the spontaneous activity as well as the mechanical sensitization might lead to ongoing pain. This leads to the article’s main proposition, which is that sensitization of pain signaling neurons may be responsible for ongoing pain. The idea is that normal daily stimuli, consisting of the body interacting with itself and the environment, can increase or maintain sensitization in pain-signaling neurons. Over time and with greater frequency of stimuli, individual events produce a summation of sensitization, leading to a lowering of the pain threshold so that normally non-painful stimuli of daily life maintain ongoing pain (see figure below). The overall level of sensitization can be increased further by neurons that have been primed by inflammation or neuropathy. This stimulus-evoked sensitization can wax and wane, and when at capacity may generate ongoing discharge. This intriguing hypothesis was welcomed by the Journal Club participants. 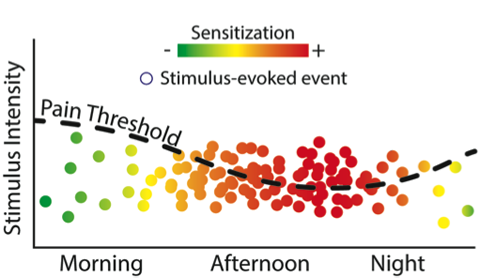 We reasoned that if stimulus-evoked summated sensitivity was a generator of ongoing pain, then a period of midday rest could test whether reducing stimulus-evoked sensitization could prevent pain from becoming unremitting or lower the intensity of already ongoing pain. The group also considered the prevalence of which clinical pain syndromes might be generated by summed sensitization from repeated stimulus-evoked events, but without practicing pain physicians attending the meeting to share their clinical insight, we had trouble imagining the daily progression of pain in patients with these syndromes. Our lack of knowledge on this topic was considered to be an obstacle to translating theories about the nature and mechanisms of ongoing chronic pain. Reply to Drs. Loeser and Mogil. Bennett GJ J Pain. 2012 Oct; 13(10):934-5. High spontaneous activity of C-nociceptors in painful polyneuropathy. Kleggetveit I P, Namer B, Schmidt R, Helås T, Rückel M, Orstavik K, Schmelz M, Jørum E Pain. 2012 Oct; 153(10):2040-7. Chronic pain is more than a peripheral event. Loeser JD J Pain. 2012 Oct; 13(10):930-1. The etiology and symptomatology of spontaneous pain. Mogil JS J Pain. 2012 Oct; 13(10):932-3. Clinical and pre-clinical pain assessment: are we measuring the same thing? Vierck CJ, Hansson PT, Yezierski RP Pain. 2008 Mar; 135(1-2):7-10. Epub 2008 Jan 22.